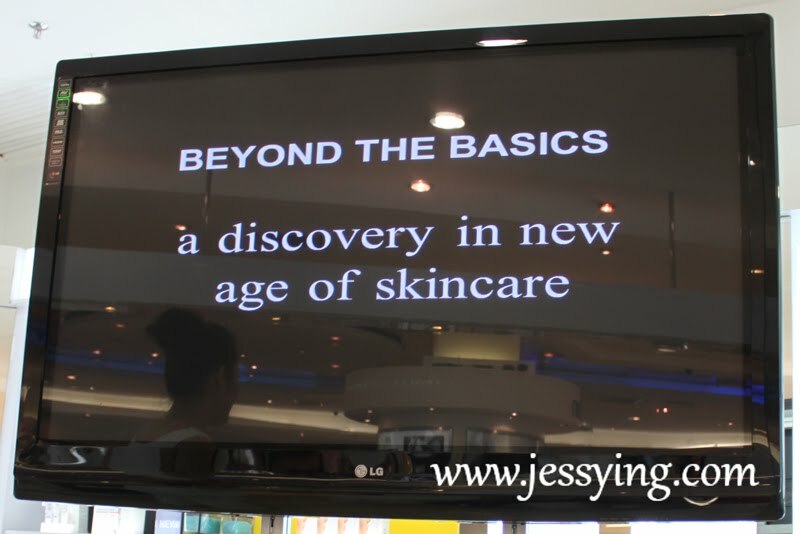 Two weeks ago I was invited to attend an event titled Beyond the Basic: A Discovery of New Age of Skincare which was held at Parkson KLCC and I was really curious what is the new age of skincare they are referring about! The NEW age of skincare that presented to us is the Cosmeceutical product range and I have to admit that I heard it before but have no clear idea what is it about. And after a good 2 hours sessions with the experts now I can share with you guys what is this Cosmeceutical products about here! Cosmeceutical product is not our normal skincare products because it is a product that combines cosmetics and pharmaceuticals for maximized efficiency! What makes Cosmeceutical product different from our usual skincare products is that it contains active ingredient purporting to have medical or drug-like benefits. These products are backed with extensive research and clinical trials that provide proven results. 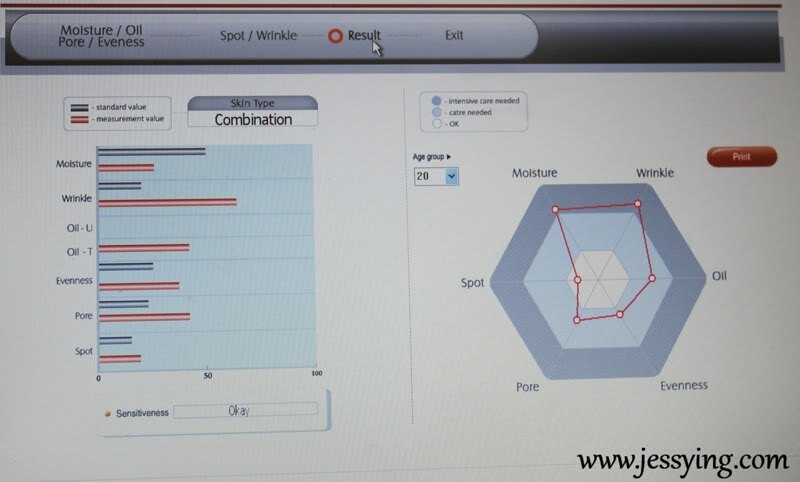 And this would simply means, Cosmeceutical product is a product that specifically invented to target to your concern and you can be confident when using it simply because there are clinical studies which tried, tested and proven the efficiency of the product. And this clinical studies are conducted by professional scientists in lab and not the not the normal focus group Q&A research kinda of thing. Cosmeceutical counter at Parksons KLCC beauty hall. There are a total of four brands that are introduced to us which are Cosmeceutical skincare product are Bremenn Research Labs, Talika, StriVectin-WH and Perricone MD. A great plus point for all these brands are they are FREE from paraben!!!! i) Bremenn HylexinEye cream (RM235 for 15ml) paraben-free is the first formula specifically developed to dramatically reduce the appearance of serious dark circles and recently they have improved their formula with up to five botanical extracts to increase the effectiveness of the product. 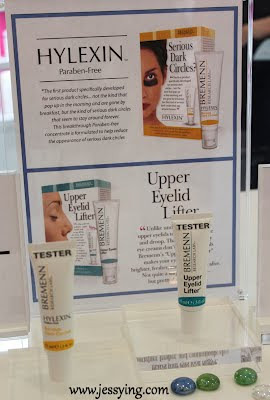 ii) Bremenn Upper Eyelid Lifter (RM235 for 15ml) is the first product I came across that focus to help to reduce our upperlid tend to sag, deflate and droop as usually eye products focus on under-eye puffiness or dark eye circles. Something really interesting, I should check this more later on! 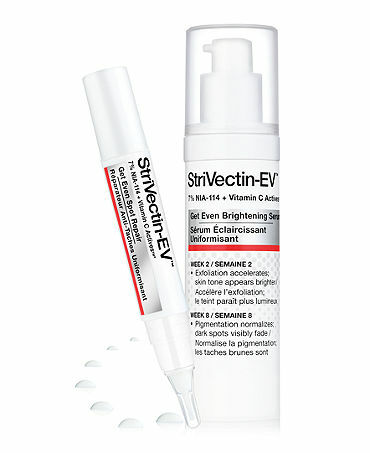 StriVectin is a leading clinical anti-aging brand that uses problem-solution skin treatments to address the full spectrum of visible aging issues. Their skin solutions are formulated with the patented science of NIA-114, a niacin molecule discovered in skin cancer prevention by Drs. Myron & Elaine Jacobson. 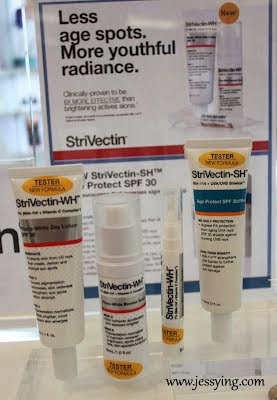 Recently they introduced new StriVectin-WH™ Photo-White Booster range which consists of Booster Serum (Rm347 for 30ml), Spot Repair (Rm186 for 4ml) and Day Lotion SPF 30 (RM285 for 50ml) which was developed for those who are looking for more translucent, even-toned skin with less hyperpigmentation. Will talk on the details soon! 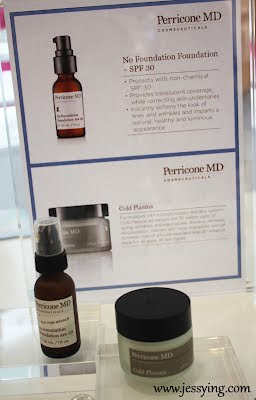 Perricone MD is founded in 1998 by Dr. Nicholas Perricone, Perricone MD features a collection of exclusive, unique and highly efficacious Cosmeceuticals comprised of patented and proprietary technologies that have revolutionized anti-aging skin care. They are well-known for their star product Cold Plasma (Rm669 for 30ml) which was formulated with a revolutionary ionic suspension carrier system that delivers customized cellular nutrition to the face for visibly firmer, brighter, smoother and radiant skin. And many of my friends swear by this and I think I gotta give this a try soon! And another product which captured my attention is No FOundation Foundation (RM223 for 30ml), which is a multi-purpose product that provides natural translucent coverage for a smooth glowing finish, while protecting with a natural SPF30. This is not your normal foundation that merely giving a veil to your face but it is formulated with proprietary patented anti-oxidants that delivers anti aging benefits to diminish the appearance of fine lines, wrinkles, discoluration and loss of firmess. After putting on Perricone MD No FOundation Foundation, you will expect your face to have a dewy finish with your skin looking naturally smooth, radiant and beautiful. The last brand that was introduced to me was Talika, and they are not a stranger to me simply because I have used their star product Lipocils (RM185 for 10ml) before and it worked! It is an eyelash treatments that speed up our eyelash grow and I saw their result in 28 days just as they claimed, amazing right! 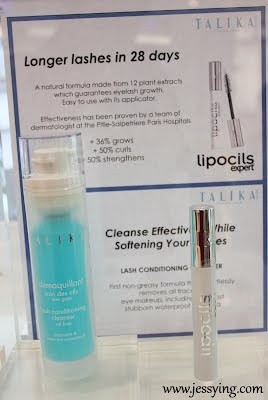 Anyway besides Lipocils, TalikaLash Conditioning Cleanser (RM110 for 100ml) is also one of their best seller. It is gentle enough for sensitive eyes but powerful enough to take on the toughest waterproof mascara, the Lash Conditioning Cleanser removes makeup while toning and strengthening lashes. I tried the texture, its quite jellyish and I quite like it when I tried it on! 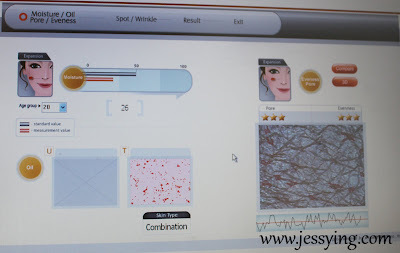 Anyway we are being challenged to try out Cosmeceutical skincare products to see whether they live up to their claim! First and foremost, in order to make sure the Cosmeceutical product works on one's skin, we have to determine our own skin's concern. Definitely I know we don't have only ONE skin concern only! 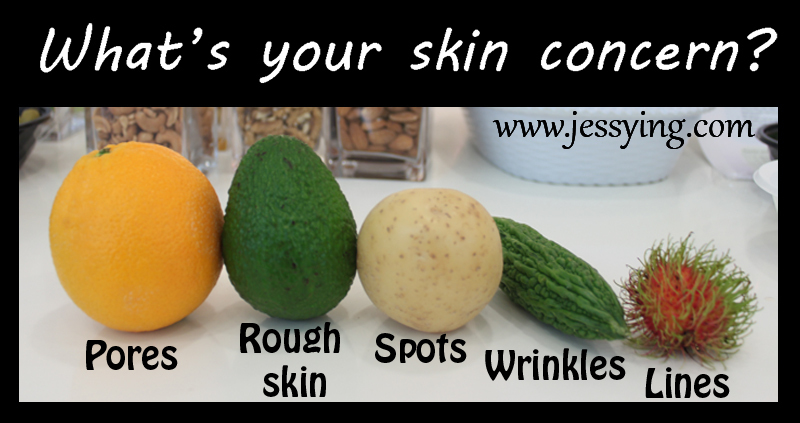 But here we need to focus on a particular skin concern that we think is crucial and need immediate attention in order for us to select the proper Cosmeceutical productto try out to see the effectiveness! I got to be honest, I myself am very much concerned about all the skin problems stated above except acne. However I do realised in this recent two years when I am approaching late twenties my pigmentations/dark spots problems have been more serious. 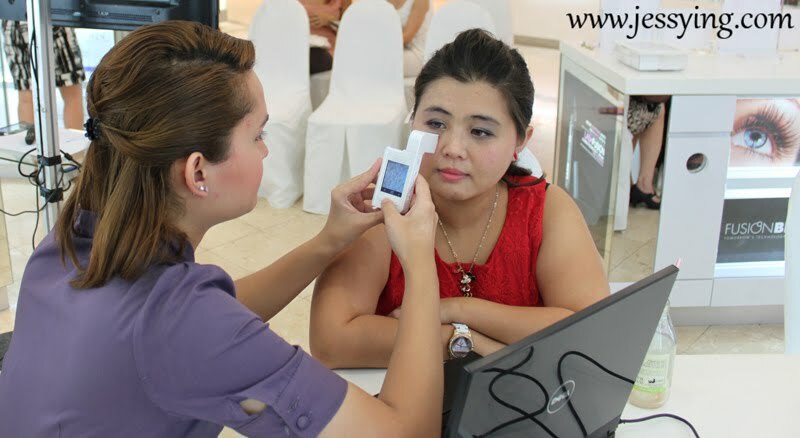 Personally I have tried many skincare product to reduce or lighten the pigmentations on my face knowing the fact that it cannot be removed easily (unless going through laser treatment). I don't know whether to be happy or sad to say that some whitening/brightening skincare products does worked on me but the duration to show the result is slow or the result is not obivious and the ingredients in the products often causing my face feeling dry. Skincare products are known to give slow result and this would mean that we need to have long term investment to use the whitening/brightening skincare products in order to see the result and often they are not very cheap to start with. 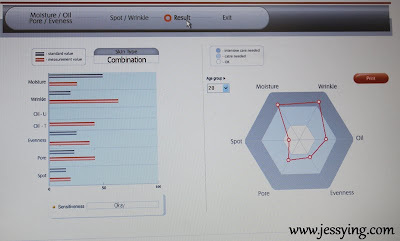 At the event (2 weeks back), I was given a skin test to see what are my skin condition . The thing about skin test using professional machine is that they could tell you speficially what are your skin's problem and how serious they are! And I always felt we would not know our real skin's problem under we go for a skin test. 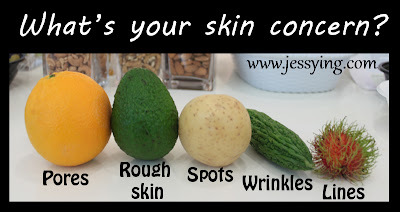 Because it tells you everything, from the outer layer to deep layer of our skin epidermis. And I gotta say yes it's scary to know the truth and the good thing is we can see from the skin test which skin concern need immediate attention. An over view of my skin condition 2 weeks back. I know how it became worst when my living lifestyle is bad and I was stress about work. I was determine to get rid or reduce the pigmentation on my left cheek which I mentioned earlier on and I was recommended to try two products from StriVectin-WH™ range, i.e StriVectin-WH™Photo-White Booster Serum and StriVectin-WH™ Photo-White Spot Repair for 14 days. 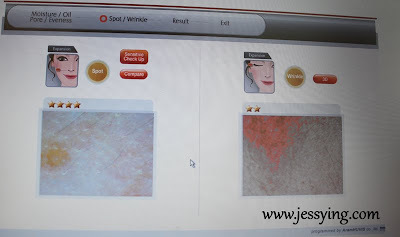 Check out the next post on my review on these both products whether it works for me after 14 days! Before I end this post, a group pictures with brand's representative together with Juli & Haze who are also particapting in this 14 days challenge!